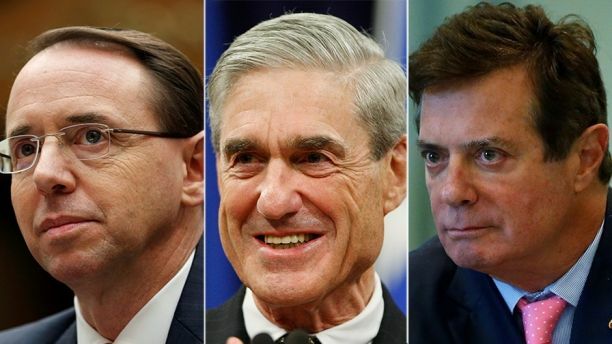 Former Trump campaign chairman Paul Manafort, right, and his legal team, are suing Special Counsel Robert Mueller, center, and Deputy Attorney General Rod Rosenstein, alleging the Russia probe has gone beyond the scope of the special counsel regulations. Former Trump campaign chairman Paul Manafort and his legal team are suing Special Counsel Robert Mueller and Deputy Attorney General Rod Rosenstein, alleging the Russia probe has gone beyond the scope of the special counsel regulations, according to an 18-page civil complaint filed with the district court in Washington. In October, Manafort and his business partner Rick Gates pleaded not guilty to a 12-count indictment that included allegations of money laundering and making false statements in connection with their work in Ukraine. The complaint continued, "Those alleged dealings had no connection whatsoever to the 2016 presidential election or even to Donald Trump." Manafort's legal team is asking the court "to hold those actions unlawful and set them aside." According to the complaint, Mueller was given additional authority to pursue "any matters that arose or may arise from that investigation." Manafort’s legal team alleges the deputy attorney general went beyond his "authority to appoint a special council as well as specific restrictions on the scope of such appointments." At the time of the May 2017 appointment of Mueller, Rosenstein said, "It is in the public interest for me to exercise my authorities and appoint a special counsel to assume responsibility for this matter." Meanwhile, Rosenstein arrived on Capitol Hill Wednesday afternoon to meet with House Speaker Paul Ryan on the Russia investigation. "Deputy Attorney General Rosenstein asked to meet with the speaker and we accommodated the request," Ryan's office told Fox News, adding that FBI Director Christopher Wray intended to meet with Ryan as well. Manafort alleges he’s been "injured" by the investigation, causing him "significant reputational harm, has exposed him to invasions of his personal privacy, and has forced him to incur substantial costs and expenses to defend himself." Fox News' Doug McKelway and Chad Pergram contributed to this report.